We like cycling. It may feature somewhat disproportionately in these blogs. Why? Cycling seems to lift everyone’s spirits – with the fresh air and scenery (or sometimes the sheer relief of finishing a ride!). It feels like the golden stuff of family memories. More practically, we have bikes so it’s not too expensive and it’s something we can do with all our children – from 2 to 18. 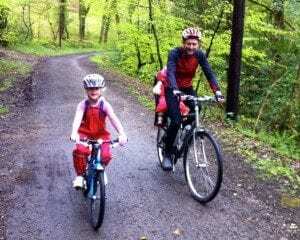 This May bank holiday the weather wasn’t right for the beach so we plumped for a Camel Trail expedition. 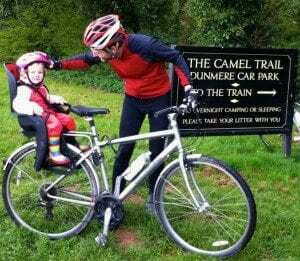 The Camel Trail covers a total of 18 miles, but can be cycled in sections. Its largely traffic-free, surfaced paths are suitable for cyclists, walkers, horse-riders and wheelchair users. The trail snakes through winsome, serene Cornish countryside. The Wadebridge to Padstow (5.5 miles) section, with its Camel estuary views (and option of Padstow fish and chips), is highly popular. 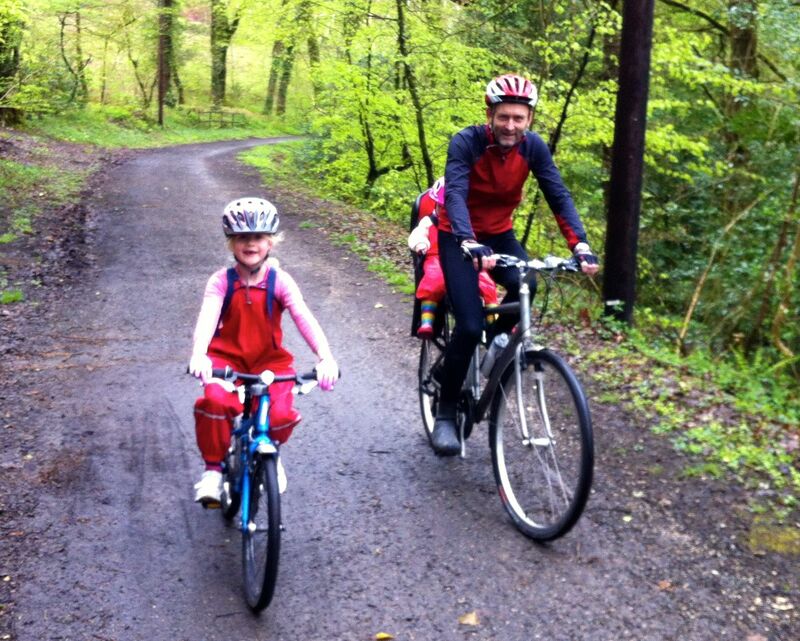 But, we also enjoy the Camel Trail’s quieter, lesser known branch – Bodmin to Wenfordbridge – which is 6.25 miles long. It’s much quieter (perfect for a bank holiday), which means we can relax when our seven year old meanders across the path or stops dead in her tracks, or when our toddler needs an emergency al fresco wee. Bodmin to Wenforbridge is an inland trail sheltered by towering beech trees, from wind and rain. It’s adorned with wild flowers and the fast-flowing rapids of the Camel river. Leaving the house seems to take for ever. Tim and I can pack for a day trip in about an hour now (plus 20 mins for a brace-yourself-for-a-family-adventure coffee). Our two-year-old, Saskia, is reluctant to wear her waterproof all-in-one – even when we hopefully refer to it as her ‘cycling suit”. She relents when she sees her older sister in cycling tights. We’ve invested in cycling bottoms and gloves for Bathsheba for comfort and warm, and she enjoys feeling like a proper cyclist. Emergency chocolate bribes are also packed. There’s a car park at the Borough Arms, just outside of Bodmin on the road to Wadebridge. I’d advise you to distract children at the entrance as there is a play park for pub customers only. Parking is free and plentiful. I took a backpack of spare clothes and snacks. Our roles are clear: Tim talks to Saskia who is in the baby seat on the back of his bike, narrating the scenery as we go while I distract/cajole/bribe Bathsheba along the path. Cycling always seems to lead to broad-ranging, interesting conversations between the children and us. The paths are flat, quiet and reasonably wide with just two or three stops to cross minor roads. It feels safe for children to get some speed up and grow in cycling confidence. Our destination is the Snail’s Pace Cafe.  The cafe (opened just two years ago) is welcoming and child-friendly, and the food is sensational. Magnificent homemade cakes, quiches,pate and salads, toddler’s platters (including humous and rice cakes) and Famous Five hearty sandwiches. Although the highlight for the children appears to be trips to the eco-friendly composting loo! The six miles home seem faster. Bathsheba is going strong and using her gears more effectively. Did I hear that right? She’s just proposed a cycling holiday.